First of all, this question brings forward the issue that you have to know what is normal or typical or expected in order to be able to make meaning out of a type of data that is new to you. I ran across this problem the first time I collected spatial visualization data. The scores on Piaget's water level task looked terrible to my eye--but I had no real idea what would be typical or should be expected. Likewise, this student probably had no idea what would be expected or normal for sea surface temperature. Secondly, ocean temperature varies from place and place and changes on many times scales, including time scales that are short relative to the human lifespan. 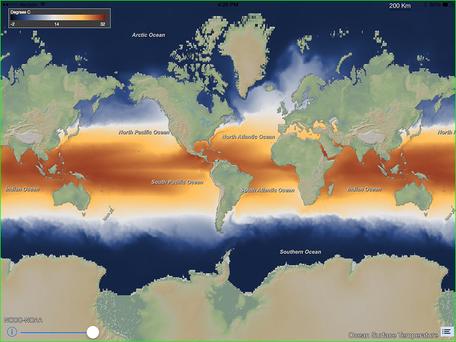 If constrained to present one data visualization to portray "sea surface temperature," how to cope with the dynamic and ever-changing nature of the referent? A snapshot from last week? An average over time? A model output? Which is the most veridical when the object of study is too fast to measure synoptically? Thirdly, there is the issue of anthropogenic climate change. We've heard extensive debate about how much the temperate of the atmosphere will rise, or should be allowed to rise, under the influence of human-caused greenhouse gas emissions. A parallel question can be asked about the ocean: how much can ocean temperature rise before harming coral, krill and other marine life. And finally, I have to say that I find the student's wording to be poetic. I would have phrased this question as: "What should the temperature of the ocean be?" The unusual cadence of the student's question strikes my ear as beautiful. The student was looking at data visualizations related to climate change in polar regions using the Polar Explorer iPad app, which was created as part of the PoLAR Climate Change Education Partnership. I've found one useful reference on fostering question-asking in students: Rothstein, D., and Santana, L., 2014, Make Just One Change: Teach Students to Ask Their Own Questions, Cambridge, MA, Harvard Education Press. This is a great question! I have been working on updating my Oceanography course this year and one of my overarching goals is to get the students to ask more questions -- not just of me, but about the material as a whole. It reminded me of this talk a math teacher friend pointed me to a while ago that I just watched again this morning. So I thought I would share it even though it is aimed at younger learners, the idea is the same. Title: "Ever Wonder What They Would Notice (if only someone would ask)?" I love the "noticing and wondering" framing that the educator in your math video used with math students. I think this would also work well with geo students (of all ages) looking at data. "Noticing" is what we would traditionally call "observations" and "wondering" is where the fertile ground lies for creating or unearthing what we would traditionally call "interpretations." These friendly, every-day words separate out these two importantly different types of reactions to viewing a new data set. Thanks for sharing this.